Mainland Machinery / Manufacturing / 3D Printing for Metal Fabrication: Helpful? 3D Printing for Metal Fabrication: Helpful or Not? The implementation of 3D printing has revolutionized modeling and prototyping for metal manufacturers. The 3D printers allow for rapid prototyping from AutoCAD designs, including custom components, which enable complex designs that are difficult to produce with conventional machining, molding or casting. 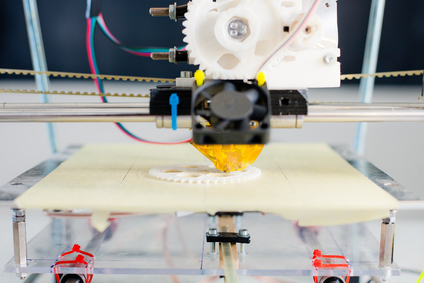 At first, 3D printers were used to create plastic models. This restricted its capabilities to only certain types of projects for sectors such as construction, consumer product design and engineering projects. They were primarily used to develop models for demonstration purposes. Unfortunately, 3D printers are found inadequate in heavy industries like mining and metal fabrication. Although 3D printers simplify manufacturing and product conception, it is important to keep in mind that its technology is still restricted to working with liquefiable materials such as plastic and polystyrene. When considering materials like metal, the challenges significantly increase. Consistency in finish: The widespread use of 3D metal printing, in the Canadian mining industry, has been delayed, because the proper finishing required for the final product remains inconsistent. Consistency with internal finishes is important for products such as engines, moving parts and gears. However, with 3D metal printers, this is difficult to achieve as most metal casts may have liquid or air passing through them at a high speed, which results in uneven interior surfaces that may lead to corrosion. Achieving the required strengths to withstand stress: Products and tools that are used in the mining industry are consistently under high pressure and stress. They must be reliable, without cracking, bending or breaking, after repeated use. However, certain metal alloys used in mining components are difficult to work with, because tool manufacturers require high production capacity at low cost. High costs in producing simple machine parts: Large companies mainly use 3D metal printers for low-volume complex designs on the shop floor. Currently, mass-production of simple mechanical products is expensive in correlation to traditional mass-production techniques such as casting or welding. Difficulties in working with certain metals: Creating components out of certain metals, like titanium, makes 3D metal printing laborious. Aside from the cost of titanium, the main drawback is that it is challenging to work with, because it has a tendency to harden during cutting and forming, which results in high tool wear. Additionally, when welded, it weakens the welds if the proper precautions are not followed. Technical challenges still need to be addressed: Various challenging areas have yet to be addressed such as faster build times, better quality prints, and easy to use CAD-CAM software. Unless these areas are improved upon, many manufacturers will become aware of the indirect costs of building components, through the use of 3D metal printers, being higher than that of traditional metal fabrication methods. The 3D printing technology has made it possible to challenge the manufacturing processes of many industries such as medical, aerospace and consumer products; however, it has become relegated to niche components and products. In the mining industry, where components and tools must be strong, relatively simple and built in mass quantities, 3D metal printers will inevitably fall short in delivering the perceived benefits.